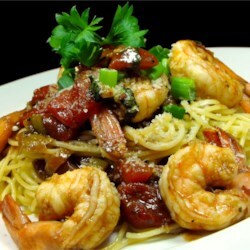 "This is a very simple yet exciting dish your family will love. 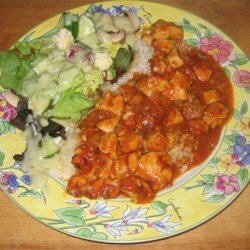 Its something different from your average chicken recipe." 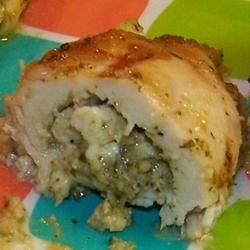 This is an easy stuffed chicken breast that is absolutely yummy. Whisk together the lemon juice, extra-virgin olive oil, Greek seasoning, and lemon zest in a bowl. Pound the chicken breasts between sheets of wax paper or plastic wrap to a thickness of about 6mm. Marinate the chicken in the lemon marinade at least 30 minutes. Meanwhile, stir together the feta cheese, sun-dried tomatoes, kalamata olives, and 1 tablespoon of oil from the jar of sun-dried tomatoes in a small bowl; set aside. Remove the chicken from the marinade, and shake off excess. Discard the remaining marinade. Divide the stuffing mixture onto each piece of chicken. Fold the edges of the chicken over the filling, and secure with toothpicks. 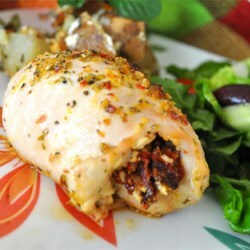 Place onto a baking dish, seam-side down, and place two roasted pepper strips onto each stuffed breast. Bake in the preheated oven until the chicken is no longer pink, about 30 minutes. Remember to remove the toothpicks before serving. 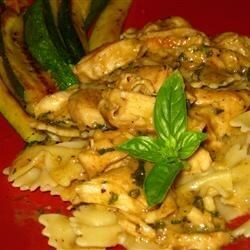 "A delicious pasta and chicken dish with garlic, sun-dried tomatoes and fresh basil. Use the dry packaged sun-dried tomatoes instead of the tomatoes packed in olive oil. The sauce can be kept, covered, for one day in the refrigerator; heat again over low heat. Try it with some crusty bread if desired." In a large saucepan over low heat, melt butter; add garlic and cook for 30 seconds. Add the tomatoes and 3/4 cup of the chicken broth; increase to medium heat and bring to a boil. Reduce heat and simmer, uncovered, for about 10 minutes or until the tomatoes are tender. Add the cream and bring to a boil; stirring. Simmer over medium heat until the sauce is thick enough to coat the back of a spoon. Sprinkle the chicken with salt and pepper on both sides. In a large skillet over medium heat, warm oil and saute chicken. Press on chicken occasionally with a slotted spatula. Cook for about 4 minutes per side or until the meat feels springy and is no longer pink inside. Transfer to a board; cover and keep warm. Discard the fat from the skillet. In the same skillet, over medium heat, bring 1/4 cup chicken broth to a boil; stirring the pan juices. Reduce slightly and add to the cream sauce; stir in basil and adjust seasonings to taste. Meanwhile, bring a large pot of lightly salted water to a boil. Add pasta and cook for 8 to 10 minutes or until al dente; drain, transfer to a bowl and toss with 3 to 4 tablespoons of the sauce. Cut each chicken breast into 2 to 3 diagonal slices. Reheat the sauce gently if needed. Transfer the pasta to serving plates; top with chicken and coat with the cream sauce; serve. "Chicken with lemon juice, egg, butter and garlic. C'est magnifique!" In a shallow dish or bowl, mix together the egg and juice of 1/2 lemon. In another shallow dish or bowl mix together the flour, garlic powder and paprika. Dip chicken breasts in egg mixture, then flour mixture. Heat butter or margarine in a large skillet over medium heat. Add chicken breasts and cook until golden on each side. 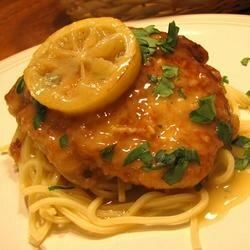 In a medium bowl, mix together broth and juice of 1 lemon, and pour mixture over chicken in skillet. Reduce heat to medium low and let simmer for about 8 minutes. Place on serving platter, and garnish with fresh lemon slices and parsley sprigs. 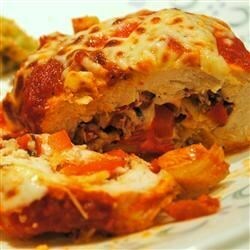 "This is a real yummy recipe. Serve it over a bed of rice. The leftovers go nicely in a whole wheat pita the next day for a warm delicious lunch. Hope you all enjoy!" Heat the oil in a wok or large skillet over medium-high heat. Cook the chicken until no longer pink in the center and the juices run clear, 7 to 10 minutes. Place the green bell pepper, yellow bell pepper, red bell pepper, mushrooms, onion, teriyaki sauce, pineapple chunks with the juice, garlic powder, and crushed red pepper into the wok, and turn the heat to medium. Bring to a simmer, stir in the flour, and continue simmering 15 minutes until thickened. In a large skillet, heat oil over medium-high heat. Add chicken breasts, and saute 4 to 5 minutes each side, until lightly browned. 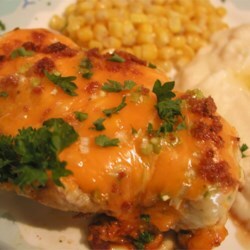 Place browned chicken breasts in a 200x300 baking dish. 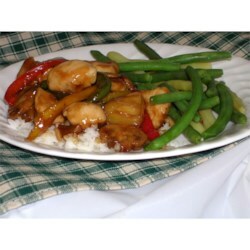 Brush with teriyaki sauce, then spoon on salad dressing. Sprinkle with cheese, green onions and bacon bits. Bake for 25 to 35 minutes, or until chicken is no longer pink and juices run clear. Garnish with parsley and serve. This is a delicious recipe that I came up with one afternoon when I couldn't find anything to make for the family! Heat oil in a skillet over medium heat. Add tomatoes, basil, oregano, artichoke hearts and red peppers. Cook until just hot, then remove from heat. transfer to a large bowl and toss together with mozzarella cubes. Preheat oven to 180 degrees C. Lay out the pounded breasts and spoon filling onto the center, leaving an inch on each side. Adjust filling as you roll so as not to over stuff. Place them seam side down into a 1,5litre baking dish. cover with marinara sauce. Place lid onto dish or cover with aluminum foil. Bake for 35 to 45 minutes in the preheated oven, or until chicken is cooked through. You'll love it!